Industry members from the largest sector of Australia’s manufacturing industry will be coming together this July, at foodpro 2017. foodpro, which takes place every three years, is the country’s largest food processing and manufacturing event and is considered one of the industry’s most important dates on the calendar. foodpro serves as a meeting point for all facets of the industry, with exhibitors from all areas of industry including plant equipment, processing systems, food handling and logistics, packaging, ingredients, hygiene and liquids and more. The 2017 show will be the largest foodpro event yet, taking up two floors of the newly built International Convention Centre in Sydney’s Darling Harbour. foodpro is unique in its function as a one stop destination for technology and solutions for all businesses in the food processing industry. 2017 marks the event’s 50th anniversary, an auspicious occasion as it not only celebrates half a century of providing a platform for networking, growth and education in the industry, but also evidences the show’s ongoing relevance to industry. Ever evolving, foodpro 2017 is introducing a new section to the show, dedicated to smaller businesses in the food processing and manufacturing industries. The Supply Chain Integrity Zone was created in response to the struggle that smaller manufacturers face in regards to achieving traceability and audit compliance. The majority of technologies are often geared to larger manufacturers, making it costly to comply, and producing a number of other obstacles and barriers. In partnership with Food Innovation Australia Limited (FIAL), foodpro’s Supply Chain Integrity Zone will focus on initiatives and solutions scalable for small manufacturers. 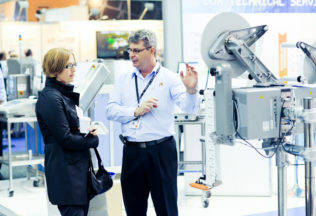 A variety of companies will be represented, allowing visitors to discuss end-to-end solutions with the suppliers best suited for their business. In keeping with the focus on providing solutions and insight to new trends and industry changes, foodpro also has a full education seminar program planned to run throughout the show. Curated with the intent to inform, challenge, and ultimately provide solutions to issues and developments in the industry, the seminars are all free to attend and will cover a diverse range of topics. Speakers include Ron Cotterman of Sealed Air, Brett Wiskar of Wiley and Glen Pinna of Biotech Laboratories, and session topics include: A New Era in Foreign Body Identification – Learn How to Protect Your Brand; Mixed Reality – The Future of Decision Making in the Food Supply Chain; Intelligent Information Driven Manufacturing: The Path to Industry 4.0 and Taking Action to Tackle Food Waste Challenges. Of particular relevance to visitors is the Food Authority of NSW’s seminar titled ‘Labelling and the Law’. Speaker Andrew Davies will explain the Food Authority’s labelling provisions under the Food Standards Code and outline the approach to compliance and enforcement. Davies will also introduce the new labelling portal that provides industry and consumers with an easy to understand guide to labelling laws. This session will give processors and manufacturers the opportunity to have direct contact and insight into the legal requirements of labelling and how to achieve compliance. As further acknowledgement of its importance to industry, the Australian Institute of Food Science and Technology (AIFST) will co-locate with foodpro for their 50th annual convention. AIFST’s Convention will host a full two-day program with a focus on food safety, packaging, sensory, nutrition and more. foodpro visitors can book a convention pass to gain access to the sessions. foodpro 2017 will undoubtedly be the most important event in the food processing industry’s calendar this year. The trends and focus on added-value opportunities across all areas of manufacturing including packaging, processing, equipment and ingredients will be second-to-none at foodpro 2017. Which inspection technology should you use? Will Lidl be good for the Australian economy and its food producers? There is no doubt about it; the Australian economy has been through a tough time of late.